Between academic superstar Grace and Olympics-caliber swimmer Audrey, middle-sister Mia (talent: getting wasted) can’t shake the “trouble” label. When Grace arrives home pregnant after her gap year in Greece, Mia looks forward to seeing her perfect sister in disgrace for once. But after scolding Grace and her posh, white boyfriend, Sam, Mum and Dad act thrilled to become grandparents while Grace—her star undimmed—will sail on to Cambridge, Sam and baby in tow. Born prematurely, Mia’s the family misfit. Grace and Audrey got their white mum’s hair; Mia’s “massive Afro” comes from their Jamaican dad. While her unmarried parents plan their belated wedding, schlep shy Audrey to swim practice, and help Grace and Sam, Mia parties with friends and steadfastly ignores pressure to plan her future. Her grades are appalling, but who cares? She’s not university bound—she’ll leave school, find work, and share a flat with chum Stella. 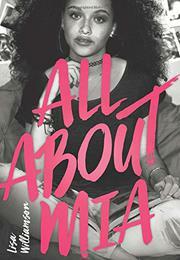 Outwardly confident, Mia’s crushed when her ex parades his new girlfriend across social media. Discovering Stella’s hidden stash of university brochures feels like betrayal. Mia knows change is needed, but refusing to own her bad choices makes it hard to accept that she has the power to make good ones. Flawed, gorgeous, smarter than she knows—as revealed in her trenchant narration—Mia’s a natural leader who’s mostly used her considerable charisma to mislead up till now.